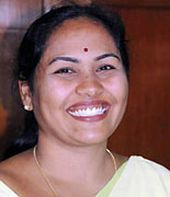 Karnataka Janata Paksha supremo B S Yeddyurappa on Friday installed his close associate and former Minister Shobha Karandlaje as working president of the party. Karandlaje, who had served as rural development and panchayat raj minister and later as energy minister in the previous BJP government, is an ardent follower of Yeddyurappa, who quit the BJP last December and floated the regional party. The KJP won a mere six seats in the May elections to the 224-member Assembly but, more importantly, secured nearly 10 per cent of the vote-share denting the prospects of the BJP. There was intense speculation over the future of the KJP in the last couple of months and on whether Yeddyurappa, a political heavyweight, would return to the BJP fold or join the Congress. The former chief minister has chosen to play his cards close to his chest and kept his options open, and on Friday, again ruled out the KJP merging with any other party and said it's open for seat-sharing arrangement for the Lok Sabha elections. Asked if the KJP is ready to have alliance even with the Congress for the polls, he said: "We are not untouchable, we are ready for seat sharing with any party including the Congress depending on the situation prevailing at that time". But he asserted, "There is no question of merging the KJP with any other party nor am I joining any other political party". The KJP would maintain its identity and the party would be strengthened from the grass-roots level, Yeddyurappa said, adding, his party would contest eight to ten Lok Sabha seats (of the total 28 in Karnataka). Meanwhile, Yeddyurappa also appointed former PWD Minister C M Udasi as the party's senior vice president, as a new list of office-bearers of the party was announced. What may happen if India voted TODAY!